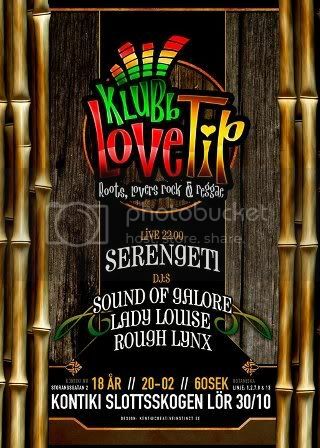 This saturday 30 Oct Serengeti perform live @LoveTip-Kontiki (Gothenburg, Swe) ls Lady Louise Rough Lynx and Sound of Galore. The live show starts early so dont be late. Afterwards we continue the evening with dancehall and reggae tunes late into the night. Make sure you´re there for a wicked night! While you wait for the live show, here´s an interview and dub combination we did for AmbassaJah Camp while touring Austria with R&B Sound.